Recently, I started diving into my utility belt. There are tools that I’ve had at my disposal for some time, some that I have tried and not gone back to, and ones that I use everyday. This has a definite potential to start exploring these utilities over the next couple of months and one that I touched on last few weeks that I want to expound a bit more on today is Red Gates SQL Search utility. I’ve come accustomed to this utility as being my quick hit Sherlock Holmes style of investigating all sorts of issues that a common data professional may encounter throughout the work day. SQL Search is a “free” tool that is an SSMS add-in that pretty much allows you to scan across all databases for a plethora of information for all objects. How do you access this utility? Once you have this open I’d like to point out a few items. 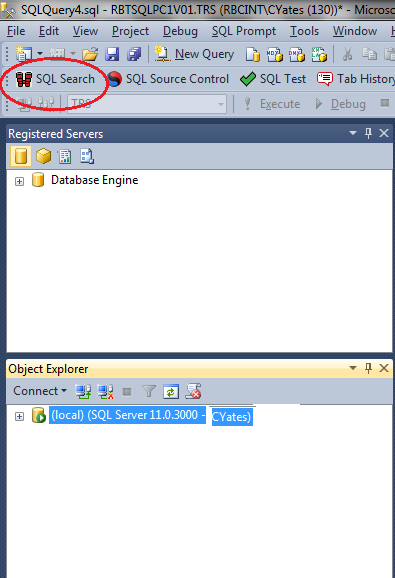 In the last image shown you will notice that in my Object Explorer I have my (local) instance selected and highlighted. If I had multiple instances in my Object Explorer SQL Search would open the tab on whichever instance I had highlighted. The last two options are self explanatory with what database you are searching in, but I do want to point out the last option where I have (local) in my drop down. Currently, I do not have a second instance fired up in my Object Explorer; if I did then you could click this drop down and hop over to the other instance. This feature is offers nice compatibility when you have to work with multiple instances at once time. Are You Using SQL Search Already? If you already are utilizing this utility then drop Red Gate a line and let them know what your thoughts are on the subject; Red Gate always enjoys getting feedback and I have never seen a more thorough company in taking use cases and every day occurances by the user and figuring out how they can make their products better. This entry was posted in SQL Server, SQLServerPedia Syndication and tagged RedGate, SQLSearch, SQLServer by Chris Yates. Bookmark the permalink.